Roses helps a lover in expressing their inner feeling and roses also symbolizes passion, love and affection to each other. Green Rose: Life, abundant growth, cheerfulness. Green roses symbolise best wishes to start a new phase of life. This is the second day of Valentine’s day dedicated to proposing your partner in the most romantic way possible. Some of the suggested gifts for this day are heart-shaped outlined gifts and heart shaped candy. On the third day, add sweetness to your relationship and pamper your soul mate with special chocolates. On this day make your loved ones happy with a Teddy bear. Teddy bears are greatly adorable and are cute gifts which brings the childhood memories and some of us still keep those memories in our bed rooms. The fifth day of Valentine’s week is meant to keep promises of love, faithfulness and supporting each other till the last breath. Some suggested gifts are everlasting memories with a laminated photo frame or a heartfelt quotes written, laminated and framed, photograph printed on a mug with some heart candies. On the sixth day turn your love into a romantic and memorable one by expressing your love. Present some kiss day gifts in form of teddies, chocolates, cakes or flowers. Gift a special perfect hug day gift and express your never ending love with a warm and tight hug. As you all know hug is nothing but an expression of affection which showcases love, care and lot of protection towards your love. Celebrate giving any of the above suggested gifts of your choice! 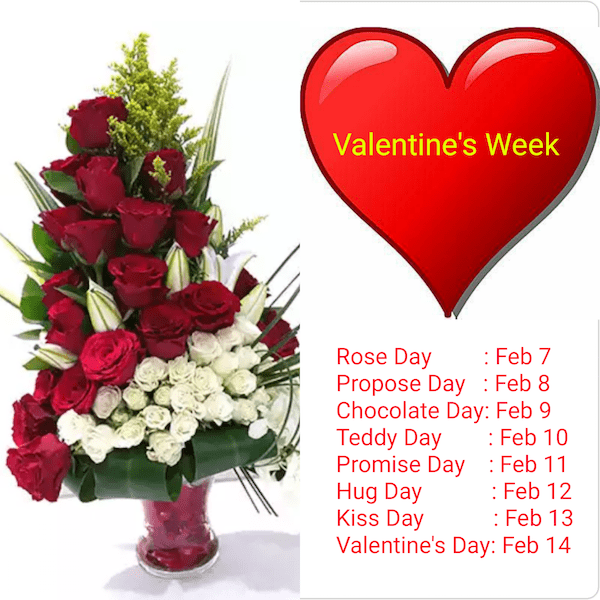 Finally the big day, celebrated on 14th of February as the Day of love and togetherness is called as Valentine’s day. What is the story behind valentine’s day? Flowers Are a Classic Gift of Distinction. A beautiful bouquet of fresh-cut flowers is the very embodiment of grace and distinction, and should not be overlooked when searching for the perfect gifts for birthday, wedding or valentine’s day. For centuries, people have sent flowers for birthdays, holidays, and to express their emotions. Not only can the flowers be tailored to the recipient’s color choices and tastes, but they bring a sense of joy to the recipient as well as provide a long-lasting gift that will brighten up any home or office. Wondering what to gift for your friend in Dubai, UAE? nothing to worry, please browse our fabulous collection of cakes and order online. We will deliver your cakes any where in UAE, especially everywhere in Dubai, Ajman and Sharjah. Well, celebrate the festival in UAE by gifting your friends some sweet cakes and chocolates. check out our section of cakes and chocolates.